" ... Gilmour was a powerful presence in Fiji long before he got into the water business. Back in 1969, he launched what would become—with help from a couple of Saudi princes—the region's biggest hotel chain, the Southern Pacific Hotel Corporation, which built a massive resort complex in Fiji. His investors and advisers have included everyone from notorious arms trader Adnan Khashoggi to George H.W. Bush ... "
THE INTERNET CAFÉ in the Fijian capital, Suva, was usually open all night long. Dimly lit, with rows of sleek, modern terminals, the place was packed at all hours with teenage boys playing boisterous rounds of video games. But one day soon after I arrived, the staff told me they now had to shut down by 5 p.m. Police orders, they shrugged: The country's military junta had declared martial law a few days before, and things were a bit tense. I sat down and sent out a few emails—filling friends in on my visit to the Fiji Water bottling plant, forwarding a story about foreign journalists being kicked off the island. Then my connection died. "It will just be a few minutes," one of the clerks said. Moments later, a pair of police officers walked in. They headed for a woman at another terminal; I turned to my screen to compose a note about how cops were even showing up in the Internet cafés. Then I saw them coming toward me. "We're going to take you in for questioning about the emails you've been writing," they said. What followed, in a windowless room at the main police station, felt like a bad cop movie. "Who are you really?" the bespectacled inspector wearing a khaki uniform and a smug grin asked me over and over, as if my passport, press credentials, and stacks of notes about Fiji Water weren't sufficient clues to my identity. (My iPod, he surmised tensely, was "good for transmitting information.") I asked him to call my editors, even a UN official who could vouch for me. "Shut up!" he snapped. He rifled through my bags, read my notebooks and emails. "I'd hate to see a young lady like you go into a jail full of men," he averred, smiling grimly. "You know what happened to women during the 2000 coup, don't you?" Eventually, it dawned on me that his concern wasn't just with my potentially seditious emails; he was worried that my reporting would taint the Fiji Water brand. "Who do you work for, another water company? It would be good to come here and try to take away Fiji Water's business, wouldn't it?" Then he switched tacks and offered to protect me—from other Fijian officials, who he said would soon be after me—by letting me go so I could leave the country. I walked out into the muggy morning, hid in a stairwell, and called a Fijian friend. Within minutes, a US Embassy van was speeding toward me on the seawall. Until that day, I hadn't fully appreciated the paranoia of Fiji's military regime. The junta had been declared unconstitutional the previous week by the country's second highest court; in response it had abolished the judiciary, banned unauthorized public gatherings, delayed elections until 2014, and clamped down on the media. (Only the "journalism of hope" is now permitted.) The prime minister, Commodore Frank Bainimarama, promised to root out corruption and bring democracy to a country that has seen four coups in the past 25 years; the government said it will start working on a new constitution in 2012. The slogan on Fiji Water's website—"And remember this—we saved you a trip to Fiji"—suddenly felt like a dark joke. Every day, more soldiers showed up on the streets. When I called the courthouse, not a single official would give me his name. Even tour guides were running scared—one told me that one of his colleagues had been picked up and beaten for talking politics with tourists. When I later asked Fiji Water spokesman Rob Six what the company thought of all this, he said the policy was not to comment on the government "unless something really affects us." If you drink bottled water, you've probably drunk Fiji. Or wanted to. Even though it's shipped from the opposite end of the globe, even though it retails for nearly three times as much as your basic supermarket water, Fiji is now America's leading imported water, beating out Evian. It has spent millions pushing not only the seemingly life-changing properties of the product itself, but also the company's green cred and its charity work. Put all that together in an iconic bottle emblazoned with a cheerful hibiscus, and everybody, from the Obamas to Paris and Nicole to Diddy and Kimora, is seen sipping Fiji. That's by design. Ever since a Canadian mining and real estate mogul named David Gilmour launched Fiji Water in 1995, the company has positioned itself squarely at the nexus of pop-culture glamour and progressive politics. Fiji Water's chief marketing whiz and co-owner (with her husband, Stewart) is Lynda Resnick, a well-known liberal donor who casually name-drops her friends Arianna Huffington and Laurie David. ("Of course I know everyone in the world," Resnick told the UK's Observer in 2005, "every mogul, every movie star.") Manhattan's trendy Carlyle hotel pours only Fiji Water in its dog bowls, and this year's SXSW music festival featured a Fiji Water Detox Spa. "Each piece of lobster sashimi," celebrity chef Nobu Matsuhisa declared in 2007, "should be dipped into Fiji Water seven to ten times." And even as bottled water has come under attack as the embodiment of waste, Fiji seems immune. 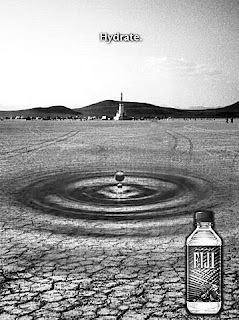 Fiji Water took out a full-page ad in Vanity Fair's 2007 green issue, nestled among stories about the death of the world's water. Two bottles sat on a table between Al Gore and Mos Def during a 2006 MySpace "Artist on Artist" discussion on climate change. Fiji was what panelists sipped at the "Life After Capitalism" conference held in New York City during the 2004 RNC protests; Fiji reps were even credentialed at last year's Democratic convention, where they handed out tens of thousands of bottles. "We are Fiji," declare Fiji Water posters across the island, and the slogan is almost eerily accurate: The reality of Fiji, the country, has been eclipsed by the glistening brand of Fiji, the water. Our last rest stop, half an hour from the bottling plant, was Rakiraki, a small town with a square of dusty shops and a marketplace advertising "Coffin Box for Sale—Cheapest in Town." My Lonely Planet guide warned that Rakiraki water "has been deemed unfit for human consumption," and groceries were stocked with Fiji Water going for 90 cents a pint—almost as much as it costs in the US. Rakiraki has experienced the full range of Fiji's water problems—crumbling pipes, a lack of adequate wells, dysfunctional or flooded water treatment plants, and droughts that are expected to get worse with climate change. Half the country has at times relied on emergency water supplies, with rations as low as four gallons a week per family; dirty water has led to outbreaks of typhoid and parasitic infections. Patients have reportedly had to cart their own water to hospitals, and schoolchildren complain about their pipes spewing shells, leaves, and frogs. Some Fijians have taken to smashing open fire hydrants and bribing water truck drivers for a regular supply. Fiji Water has also vowed to use at least 20 percent less packaging by 2010—which shouldn't be too difficult, given its bottle's above-average heft. (See "Territorial Waters.") The company says the square shape makes Fiji Water more efficient in transport, and, hey, it looks great: Back in 2000, a top official told a trade magazine that "What Fiji Water's done is go out there with a package that clearly looks like it's worth more money, and we've gotten people to pay more for us." Selling long-distance water to green consumers may be a contradiction in terms. But that hasn't stopped Fiji from positioning its product not just as an indulgence, but as an outright necessity for an elite that can appreciate its purity. As former Fiji Water CEO Doug Carlson once put it, "If you like Velveeta cheese, processed water is okay for you." ("All waters are not created equal" is another long-standing Fiji Water slogan.) The company has gone aggressively after its main competitor—tap water—by calling it "not a real or viable alternative" that can contain "4,000 contaminants," unlike Fiji's "living water." "You can no longer trust public or private water supplies," co-owner Lynda Resnick wrote in her book, Rubies in the Orchard. A few years back, Fiji Water canned its waterfall logo and replaced it with a picture of palm fronds and hibiscus: "Surface water!" Resnick wrote in Rubies. "Why would you want to suggest that Fiji came from surface water? The waterfall absolutely had to go." One company newsletter featured the findings of a salt-crystal purveyor who claimed that Fiji Water rivals the "known and significant abilities of 'Holy Healing Waters' in Lourdes, France or Fatima, Portugal." Switching effortlessly from Catholic mysticism to sci-fi, he added that the water's "electromagnetic field frequency enables Fiji Water to stimulate our human self-regulation system." In keeping with this rarefied vibe, Fiji Water's marketing has focused on product placement more than standard advertising; from appearances on The Sopranos, 24, The View, and Desperate Housewives to sponsorship of events like the Emmy Awards, the Avon Walk for Breast Cancer, and Justin Timberlake's "Summer Love" tour, it's now "hard to find an event where our target market is present and Fiji isn't," according to Resnick. As far back as 2001, Movieline anointed it one of the "Top 10 Things Young Hollywood Can't Get Through the Day Without." At the Academy Awards, E! has handed out Fiji bottles to the stars; as it happens, the complex where the Oscars is held was owned until 2004 by Fiji Water founder David Gilmour's real estate empire, Trizec (which before its acquisition by Brookfield Properties in 2006 was one of the largest real estate companies in North America, with projects including everything from the Sears Tower to Enron HQ). In a 2003 interview, Gilmour told the London Times that "the world's water is being trashed day by day." He would know: Before launching Fiji Water, he cofounded Barrick Gold, now the largest gold mining enterprise in the world, with operations in hot spots from Tanzania to Pakistan. Its mines, often in parched places like Nevada and Western Australia, use billions of gallons of water to produce gold via a toxic cyanide leaching process. Barrick's practices are so damaging that after an environmental review of the company, the Norwegian government announced last year that it would divest itself of some $200 million in Barrick stock. Gilmour was a powerful presence in Fiji long before he got into the water business. Back in 1969, he launched what would become—with help from a couple of Saudi princes—the region's biggest hotel chain, the Southern Pacific Hotel Corporation, which built a massive resort complex in Fiji. His investors and advisers have included everyone from notorious arms trader Adnan Khashoggi to George H.W. Bush; in 2004, Colin Powell presented him with the Secretary of State's Award for Corporate Excellence for his work in Fiji. Gilmour's Fijian holdings include the exclusive Wakaya resort, which boasts six staffers to each guest and has hosted Bill Gates, Nicole Kidman, and Keith Richards (who famously fell off a tree there); he also owns Zinio, an electronic publishing company that produces the digital version of Mother Jones magazine. He declined to be interviewed for this story. In the early 1990s, Gilmour got wind of a study done by the Fijian government and aid organizations that indicated an enormous aquifer, estimated at more than 17 miles long, near the main island's north coast. He obtained a 99-year lease on land atop the aquifer, brought a former Fijian environment minister on board, and launched an international marketing blitz inviting consumers to sample water preserved since "before the Industrial Revolution." To this day, Fiji Water has nearly exclusive access to the aquifer; the notoriously corrupt and chronically broke government has not been able to come up with the money or infrastructure to tap the water for its people. Fiji Water wasn't the Resnicks' first foray into the water industry: Years ago, they gained control of one of the largest underground water reservoirs in the nation, the Kern Water Bank on the edge of California's Central Valley. This vast holding system—built with public funds in 1999 to help buffer the effects of droughts—stores water from California's aqueducts and the Kern River; it's estimated to be worth more than $180 million on the open market and has allowed the Resnicks to double their acreage of fruits and nuts since 1994, according to the Los Angeles Times. With the profits from their enterprises, the Resnicks have been major players on the political scene, giving more than $300,000 each over the past decade. They have supported mostly marquee Democrats—Obama, John Edwards, Hillary Clinton, Al Franken—though both also donated to the McCain campaign. They give millions to museums, environmental organizations, and other charities: Lynda is a trustee of the Aspen Institute, and Stewart is on the board of Conservation International. One of Britney Spears' recent meltdowns led to her stay at the Stewart and Lynda Resnick Neuropsychiatric Hospital at UCLA. In June, the California Institute of Technology announced the creation of the Resnick Sustainability Institute after receiving a $20 million donation from the couple. Fiji Water also gives to a range of conservation groups, including the Waterkeeper Alliance, Oceana, the Nature Conservancy, and Heal the Bay. The charitable works Fiji Water brags about most often, however, are its efforts in Fiji itself—from preserving rainforests to helping fund water and sanitation projects to underwriting kindergartens. This January, after catastrophic floods swept the main island of Viti Levu, the company also donated $500,000 to the military regime for flood relief, and gave another $450,000 to various projects last summer. True, some of Fiji Water's good works are more hope than reality: Though Lynda Resnick insists that "we only use biofuels," the Fiji plant runs on diesel generators, and a project to protect 50,000 acres of rainforest—plugged on the actual bottle label—has yet to obtain a lease. Still, Resnick told New York's WNYC last year, "We do so much for these sort of forgotten people. They live in paradise, but they have a very, very hard life." Perhaps mindful of the unpleasantness of 2000, today Fiji Water executives refer constantly to the company's role in Fiji's economic life. "Our export revenue is paying for the expansion of water access at a pace that Fiji's government has never achieved," the company told the BBC in 2008. "If we did…cease to exist," sustainability VP Mooney told U.S. News & World Report the same year, "a big chunk of the economy would be gone, the schools that we built would go away, and the water access projects would go away." What Mooney didn't say is that though Fiji Water may fill a void in the impoverished nation, it also reaps a priceless benefit: tax-free status, granted when the company was founded in 1995. The rationale at the time, according to the company: Bottled water was a risky business with uncertain chances of success. In 2003, David Gilmour said that his ambition for Fiji Water was "to become the biggest taxpayer in the country." Yet the tax break, originally scheduled to expire in 2008, remains in effect, and neither the company nor the government will say whether or when it might end. And when Fiji has tried to wring a bit of extra revenue from the company, the response has been less than cooperative. Last year, when the government attempted to impose a new tax on water bottlers, Fiji Water called it "draconian" (a term it's never used for the regime's human rights violations) and temporarily shut down its plant in protest. While Lynda Resnick has called for "very public conduct" by private companies, she seems to appreciate that, as she wrote in her book, "transparency is a lot easier to talk about than it is to realize." The closely held company won't disclose basic data about its business (such as total charity expenditures), and it's gone to some length to shelter assets in secretive tax havens: The Fijian operation, according to court documents filed last year, is owned by an entity in Luxembourg, while its American trademarks are registered to an address in the Cayman Islands. At the moment, Fiji's government certainly seems in no mood to confront Fiji Water—quite the contrary. "Learning from the lessons of products, we must brand ourselves," Fiji's ambassador in Washington told a news site for diplomats in 2006, adding that he was working with the Resnicks to try to increase Fiji Water's US sales. A Fiji Water bottle sits at the top of the embassy's home page, and the government has even created a Fiji Water postage-stamp series—the $3 stamp features children clutching the trademark bottles. Fiji Water, for its part, has trademarked the word "FIJI" (in capital letters) in numerous countries. (Some rejected the application, but not the United States.) It has also gone after rival Fijian bottlers daring to use their country's name for marketing. "It would have cost too much money for us to fight in court," says Mohammed Altaaf, the owner of Aqua Pacific water, which ended up taking the word "Fiji" out of its name. "It's just like branding a water America Water and denying anyone else the right to use the name 'America.'" When such practices are criticized, Fiji Water's response is simple: "They don't have a ton of options for economic development," Mooney told U.S. News & World Report, "but bottled water is one of them. When someone buys a bottle of Fiji, they're buying prosperity for the country." Without Fiji Water, he said, "Fiji is kind of screwed."